Three HUGE gaps to fill on my blog: haven’t yet written about Mozart, haven’t talked about a single opera, and haven’t yet mentioned one of my favorite young conductors, Yannick Nézet-Séguin. 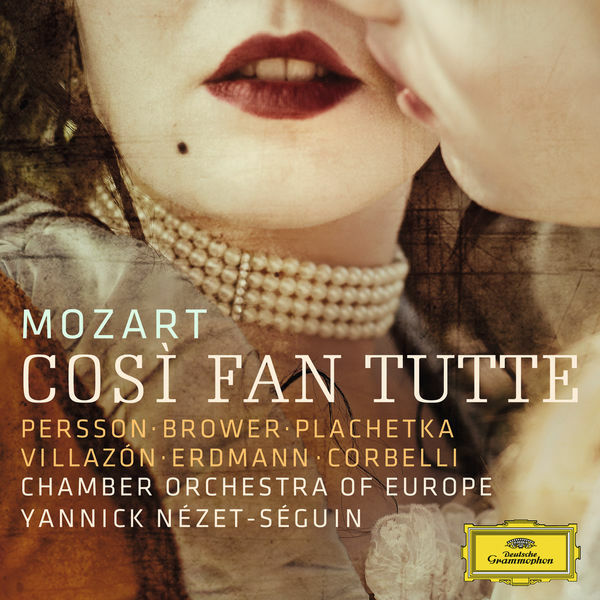 How convenient is it that I can fill all three gaps in one go, with Nézet-Séguin’s 2013 recording with the Chamber Orchestra of Europe of Cosi Fan Tutte. Some introductory words first: my background is certainly much more in instrumental classical music than in opera. I can “blame” my parents in a way, they constantly listened to classical music at home, so I grew up with pretty much the entire classical spectrum in my young ears. However, both don’t like opera, so I had to acquire that taste myself much later. To this day, the first thing I’ll notice on an opera recording, is the orchestral playing. So my judgment is heavily biased to this part. I’m much more tolerant to individual slightly weaker singers. I know true opera buffs are singers first, orchestra second. These days, there are hardly any new opera recordings released. You can’t blame the music industry, the cost of an opera production is huge obviously, and the returns in the shrinking classical market are not what they were in the heydays of “Perfect Sound Forever” when everybody re-bought everything on CD; or even in the great 50s-60s, when all the great operas were all recorded for the first time in Stereo on LP, and many of these recordings are still of reference quality. Luckily, the young Canadian conductor Yannick Nézet-Séguin got a deal with Deutsche Gramophon to record 7 Mozart operas. DG is piggy-backing here on existing performances at the Baden-Baden festival. So far, they have released 3, Don Giovanni, Die Entführung aus den Serail (to be released these days), next will be Le Nozze di Figaro (can’t wait) which is being recorded these days. I just love Mozart’s operas. They are among the most beautiful things he’s ever written, and to me THE best operas out there. Cosi has a very special place in my heart. The story is obviously a bit silly and potentially slightly sexist, but who cares with this kind of music. And luckily my Italian is bad enough that I can switch it of and don’t have to follow the lyrics if I don’t concentrate on it. There are so many beautiful parts, I can’t even list them all. So let me just stick to my favorite part of all, the Terzettino “Soave Sia Il Vento”, gentle be the wind. where the two female protagonist wish their male companions smooth sailing in their fake trip to war. This could easily be among my top10 most beautiful musical pieces ever (actually I’ve just written a post about just that here). What is there to say about this particular recording? Well first of all, the orchestral playing of the Chamber Orchestra of Europe is outstanding. So as said above, this already gives me 80% of what I’m looking for in Opera. Nézet is consistent with his typical style, which can be summarized as “reasonably fast” and most of all “tight” (not sure if I’m making sense here), in a nutshell, he’s always in control, and there is always great tension. Personally I like all the protagonists singer here, although I’ve seen several reviews criticizing Roberto Villazon especially. That said, Gramophone had this album shortlisted for the Gramophone Awards. You can download the album here (I recommend the 24/96 high-res version) or buy the physical CD here. Cosi was the first complete opera I learned (sang both Don Alfonso and Guglielmo at one time or another), so holds a special place in my heart, as well. What a pleasure to be able to sing such beautiful music! I’m jealous. The Serail should be out now: http://www.prestoclassical.co.uk/r/DG/4794064, however, the Guardian doesn’t sound to happy about it (http://www.theguardian.com/music/2015/jul/08/mozart-die-entfuhrung-aus-dem-serail-nezet-seguin-villazon-cd-review).